"Chekhov is probably better known in Britain for his plays than for his prose. For many, however, it is his short stories that mark the high water of his genius. It might at first glance be hard for those not used to his style of narrative to see what the fuss is about - and fuss there is: for most authors and lovers of literature Chekhov is incomparably the greatest short story writer there ever was. These tales appear to be about nothing. Some seem shockingly short and disarmingly inconsequential. They often fail to provide that sting in the tail or punch in the gut that we associate with the kind of popular Roald Dahl, Somerset Maugham story. But if you let character, observation and language do their work in your mind - hope you will agree with me that no writer captured, mood, moral entanglement, familial love and the pains and joys of humanity quite as well and with quite so much painterly detail, sympathy and fellow-feeling as Anton Chekhov." written by Stephen Fry. A nice sampling of shorter works by Chekhov. 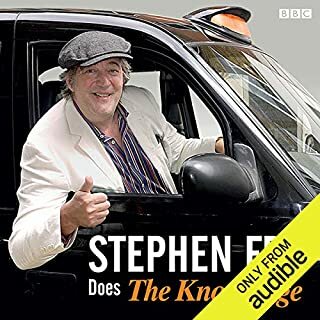 Stephen Fry is a first-rate narrator. He succeeded in doing what he said he wanted to do: stimulated my interest in Chekhov and sparked an effort to read (and listen to) more. 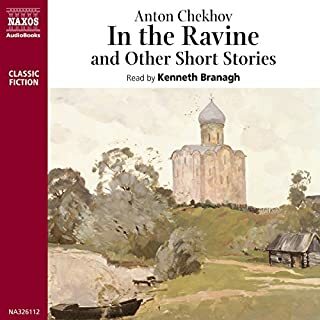 Fortunately, to meet that need, there are several other audiobooks of Chekhov stories on Audible (by Kenneth Branagh and Ralph Cosham among others) with surprisingly little overlap: and of course a half-dozen new translations in the trade paperback market. The stories are sometimes light, sometimes dark, always full of selective and evocative detail. They have a certain quality I can't quite articulate: a kind of compassionate satire. My one complaint, and it's something that's true of many short-story collections from Audible, is that the stories are jammed together: one story ends and the next begins in practically the same breath. Please: especially with stories like these, give us a couple of seconds of dead silence between each story: we need a moment to absorb the impact. With clarity of voice and precision of diction, Stephen Fry brings Anton Chekov's work to life in this 1:48-minute collection. A must own! Mr Fry is just the man to do this. character and the narration with a smoothe but not slick authority. He's a delight to listen to. Secondly, this is a nice selection of Checkhov's work.These stories are funny, moving and true to life. Previously I've only read Cehckhov, hearing it enhances the experience considerably. Recommended with the highest enthusiasm. 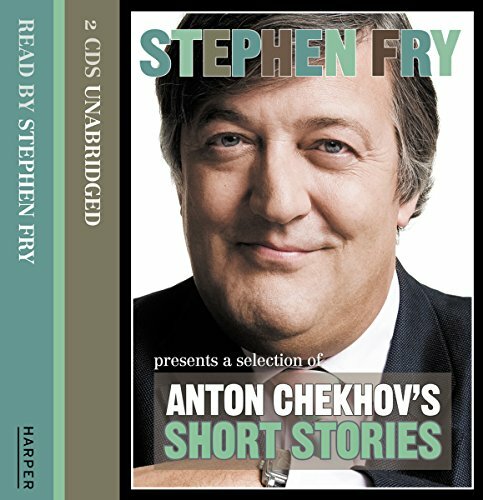 Where does Stephen Fry Presents a Selection of Anton Chekhov's Short Stories rank among all the audiobooks you’ve listened to so far? There was an issue with the editing. Each time a story ended, there was, literally, no pause of any kind before the next story began. The first syllables of the next story would almost overlap the last syllables of the prior story. This was a little confusing - but otherwise a great listen. This is one of the best audiobooks I've ever downloaded here at Audible. I've read the stories before and expected to enjoy this, but I found that I absolutely adored it. Stephen Fry is delightful in everything he puts his hand toward. 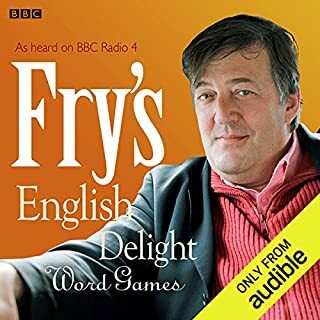 I've purchased all of "Fry's English Delight" series and his other audio selections available here and this is by far and away the best. Fry doesn't just read the stories, he absorbs them into his being and then performs them with a perfect understanding of Chekhov's vision. Fry is the ideal choice for this performance because he is always at this best when dealing compassionately with the absurd contradictions of human nature, as was Chekhov. I will keep this collection in my rainy day box and pull it out for a re-listen anytime I need cheering up. Fabulous collection, I only wish it were longer. This would have been AMAZING if only the producer had put 1 or 2 seconds between each story. Now they are so scrunched together that the last word of one and the title of the next are hard to understand. No time to cogitate on what happened. This would be among my favorite audiobooks if not for this error: at the end of each story, the last word is cut midstream, and the title of the next story inserts itself abruptly, scattering one's perceptions and feelings about the whole previous arc. Chekhov is unparalleled; Fry is empathetic and expressive; all that is lacking is a short pause at the end of each story, for the reader to finish the thought begun by Chekhov's last lines. Sweet voice for each sweet story. Exceptional. 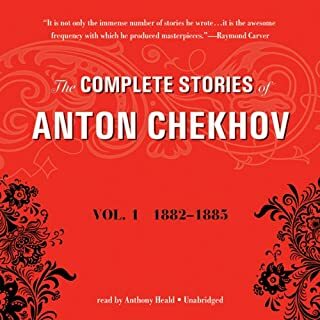 I wish I could find more audio versions of Chekhov's stories. Stephen's delivery is spot on. I'm a fan of short stories, but a lazy fan. when I find them dropped in my lap I gobble them up but I don't tend to seek them out, laziness. when I come across a good set, like this one or the short story collection from Ted Chiang, I fall in love with the intimate format all over again. This collection cements Checkov as the master of the short story. In 5 minutes you come to know the soil of the characters, usually just one or two people in ordinary moments. In these characters you come to find parts of yourself or your friends and family. I can't recommend Checkov enough. Stephen Fry's narration makes these stories warm and approachable. Checkov is the sort of literature people read in college, but with a familiar voice in your ear you won't be afraid of the journey. Snap this up. Humorous characterisations in well-developed vignettes of pre-revolutionary Russia. A glimpse of the every day and the absurd that still works on many levels. A good collection that will satisfy. Chekhov and Fry dispense introductions: larger than life writer and fantastic performer. Hearing Chekov's poignant stories with Stephen's unique acting is a treat. But the audio book is very poorly edited: chapters are cut off before really ending and one can barely hear the story's name at the beginning. Chekhov is said to be one of the World's most admired playwrights/authors among thespians. Part of the reason for this is that few have read him & he sounds bewilderingly hard to get into (similar to the reputation of James Joyce or Dostoyevsky). The fact is that he isn't really that daunting and his short stories are accessible & often fun. Couple this with having the Master of Eloquent Simplification reading it (and a good translater in Constance Garnet) and you will find that this download makes an excellent introduction to Chekhov. One thing I would say is that it did take me two full listens to really get into the stories, so this is not for those who want easy, light reading. However, when compared to Dickens, it is light as a Fairy Cake. Overall this download is a rewarding experience. I would say though that 7 stories (& 80 minutes of material) is a bit mean on the part of the publishers. There is also the fact that Stephen Fry has recorded better audio downloads (e.g. ? 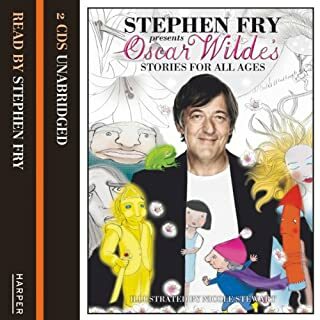 Stephen Fry Presents a Selection of Oscar Wilde's Short Stories ? & ?Fry and Laurie Read Daudet and Jerome? ), which are worth trying before this as they are simpler & more complete. 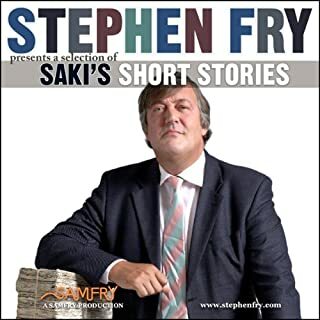 These short stories are interesting and well read by Stephen Fry, however, the editing is very poor, the last word of one story then the title of the next are read like a sentence, sometimes I'm sure some of the words are cut off. As an introduction to chekhov this has left me wanting more. The avenger was my favourite. What did you like most about Stephen Fry Presents a Selection of Anton Chekhov's Short Stories? Short stories appear to be the perfect vehicle for audible. Here, raconteur par excellence, Stephen Fry does justice to Chekov's stories. His "Oysters!" still ringing in my head. Intriguing, enetertaining and it for people with a short attention spam. The accents, the jumping in and out of characters, the clear love he has for these stories. It absolutely shines through. It's a collection o short stories that make you think and certainly have a darker side to them. The stories are entertaining. Stephen brings the characters and the circustances of the stories alive with his rich range of expression. I like Stephen Fry, but I was not convinced by his reading. But what really annoyed me were the announcements of the stories, very fast and with almost no time to breathe in between two stories- as if they tried to record as many stories as possible in a short period of time. What three words best describe Stephen Fry’s voice? Could you see Stephen Fry Presents a Selection of Anton Chekhov's Short Stories being made into a movie or a TV series? Who would the stars be? Stop giving us questions to answer,it makes no sense for review! I loved the witty black-humoured short stories, especially ‘the duel’ and ‘oysters’. Initially I was unsure about Stephen Fry’s reading style but I came to enjoy the fast pace and focus on the comedic aspects. Unfortunately the recording was let down by the editing. There were only milliseconds between the poignant endings of the short stories and the beginning of the next, in some cases Stephen Fry didn’t even get to finish his final words!